So, you've scheduled a portrait session and now you want to know what you can do to prepare for it. The most important aspect of any portrait is the face. When looking at a portrait the viewer's eyes should always be drawn to the face (or faces). The photographer will do everything they can to accomplish that goal. 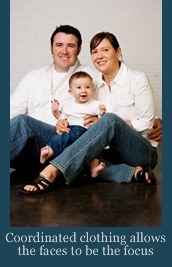 However, there are additional things that you, as the subject, can also do to help make your portraits exceptional. This article is full of tips and ideas that will help you get the most out of your session so you can have beautiful portraits that will be treasured for years to come. Your Hair: One of the first things to think about when planning a portrait session is your hair. There are a few rules of thumb that will help guarantee a pleasing portrait. Be clean shaven, or have your facial hair neatly trimmed. Have your hair cut at least one week before the portrait session. Avoid new styles; plan on a hairstyle that is comfortable to you. Avoid trying new styles just before a portrait; plan on a hairstyle that is comfortable to you. Unless doing glamor portraits, avoid overly fancy styles and up-dos. The portrait should be a good representation of how you usually look. Wear Glasses or Contacts: Another consideration is for people who may wish to wear glasses in the portrait. If you wear both contacts and glasses alternately, you should decide which look you would prefer in the portrait. However, if you regularly wear glasses you should plan on wearing them for the portrait. This will allow the photo to be a true representation of how you look. Unfortunately, wearing glasses in portraits can cause a number of problems, such as reflections of light on the lenses, distracting lines (in bifocals and trifocals), distortion of the eyes, and other such problems. There are a few options for people who wish to wear glasses in their portraits. One is to borrow a similar pair of frames (without lenses) from your optician. If they don't have a similar match, another option would be to have the lenses removed for the portrait. Of course, if you show up for your session with lenses in your glasses, then your photographer will do everything he/she can to minimize the problems presented by the lenses. Wearing Jewelry: In keeping with the goal of the face being the focus of the portrait, jewelry should be kept to a minimum. Jewelry easily catches and reflects the light and in a portrait this will immediately detract from the face (or faces). This is also true with clothing that may have highly reflective buttons or other elements that will catch the light. The best rule is to keep it simple. Avoid bold patterns – stripes, checks, prints, plaids, etc. These will draw attention to themselves and detract from the faces in the photo. Avoid bright or bold colors as these will also dominate the photo. Avoid light shades that are similar to flesh tones such as taupe, pink, tan, beige, cream or yellow. 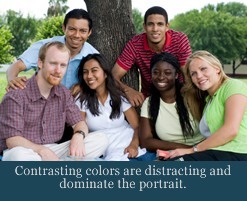 Light colored clothing is better for lighter backgrounds, but is distracting against darker backgrounds. Darker colors are flattering to the face and slimming to the figure. For formal portraits mid to deep tones are best. Solid colors or very simple patterns look best and do not detract from the face. Avoid any clothing that does not fit properly. Wear what you are comfortable in – this will help you relax, as well as being a truer representation of you. Teens and adults should wear long sleeves. Bare arms draw attention to themselves, thus detracting from the face. Women should also wear longer skirts or pants, or dark hose, for the same reason as above. Couples and groups should coordinate their clothing to be similar in both style and color tone. Contrasting styles or colors create visual confusion, and bring some subjects forward while others fade. Coordinating clothing creates a sense of unity or togetherness within a group. Coordinating clothing also allows the faces to remain the focus of the photo. Groups can wear well-balanced complimentary colors. If your feet will be in the portrait, make sure that shoes and socks are not going to be distracting elements in the portrait. Women should avoid heavy make-up. Schedule the session for the time of day when you feel you look your best. Bring a few essential items to have on hand during the session, if needed: comb, brush, hairspray, hair clips, make-up, mirror, safety pins, etc. Plan on arriving at least 15 minutes early to your session. This will allow time to make last minute adjustments to your hair and clothing, as well as give you time to relax before the session begins. RELAX AND HAVE FUN: and now, here is the most important thing to remember when having portraits taken: RELAX AND HAVE FUN!! Remember, you want these portraits to capture your true personality, so let it out! No one likes to get their photos back and see how tense and uncomfortable they look. So, let your hair down (figuratively speaking!) and enjoy yourself! Then you will have a portrait that truly reflects who you are!